One of the first books I read in 2018 was Jon Acuff's book, Finish. In the book, he lines out tools people can use to, well, finish stuff, mostly writing projects. I 'finished' the book inspired and decided it should be my word for 2018. I was going to finish house projects, finish reading a long list of books, but mostly finish a writing project I've worked on/thought about for three years now. Ok fine, mostly just thought about. However, writing was my nemesis this past year. I couldn't find the words in my head or heart. I tried many times and wrote many (not great) paragraphs, but there would be no finishing of said project in 2018. Good news: I don't feel guilty, like a failure, or any other negative burden that often comes when I don't accomplish what I set out to accomplish. The project will happen when it's time. But there is good news to share! The skies still proclaim God's glory and I finished other plans in 2018. 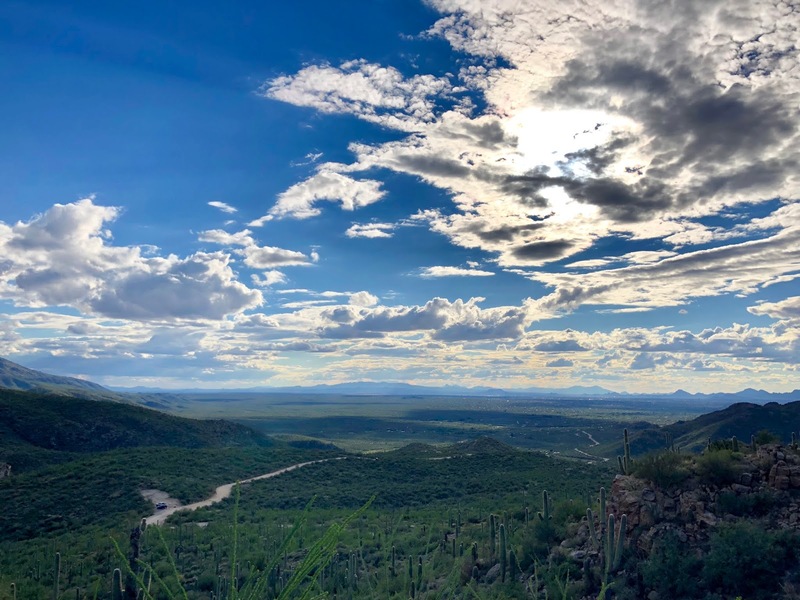 Taken on Reddington Pass east of Tucson. No filter needed or added. Pure bliss. Chad and I finished several house projects, from building the shed Second Mile gave him for a graduation gift to painting our dingy hallway doors. I'm confident we will always have house projects to work on, but I'm happy we crossed a few off the list. I set out to chronologically read through the Bible this year. Last year I enjoyed a slow, deep dive of 3 or 4 chapters, so the fire hose effect of taking it all in was quite different and incredibly enjoyable. I read the last chapter of Revelation with tears of gratitude and awe. Reading the whole Bible changed me. If you know me, you know this is a big statement: I love the Bible more than ever. It truly is God-breathed and able to teach, correct, rebuke, equip and train us for righteousness. What a gift! If you need a reading plan this year, check out this link. It isn't too late to find a plan and start. One of the surprises 2018 held for me was how many books I was able to finish. I shocked myself and feel very accomplished. Many of you hear me often quote Harry S. Truman. "Not all readers are leaders, but all leaders are readers." Reading helps leaders better understand people, learn different perspectives, cultivate creativity, strengthen communication, and so, so much more. In this book, Jared uses Scripture and anecdotes I related to, probably because we are the same age and have been in ministry about the same amount of time. He effectively shares that following Jesus isn't for the super-spiritual who have it all together, but is for all of us. Jared's humility and wisdom challenged me to remember basic, valuable, spiritual disciplines. I've followed Tish on social media for awhile now, reading almost every article she writes and resonating with her theology and worldview. Picking up this book was a no-brainer for me simply based on the fact that I truly enjoy reading her words. The book did not disappoint. Her ability to connect spiritual truth with every day life demonstrates her deep soul and love for Jesus. So much of life is monotonous and it is easy to disregard sacredness even in bed making or sitting in traffic, but this book reminds us to think about Jesus in all aspects of our days. Reading John Piper books is not for the faint of heart. And please, spare me the social media arguments you may have read against him. He isn't perfect, but the man loves Jesus and Scripture. Every book he writes is saturated with the Bible. And this particular book is about the Bible. Dream come true for me. In it he describes the Bible as one of the windows through which we view God's glory (the sky being the other one) and tells us to smush our faces against the glass to get the best possible view we can. This book deepened my love and understanding of Scripture. If you've never read one of his books, what are you waiting for? So much yes to this one! In fact, it may be one of the books we ask all leaders at Second Mile to read. It's no secret that I love my church. It is en vogue to hate churches and lament "evangelicals"; I read the news and understand. Francis strips down all the crap that has become American church culture and challenges us all to get back to loving and serving people. Thank God I get to be part of a church like this. We are absolutely not perfect, but we truly desire to be the church Jesus desires us to be. This book pressed me into deeper love for the Global Church and for my local church. Speaking of the news and evangelicalism and craziness, I picked up this book based on the subtitle: Learning from Esther in a World Gone Mad. It did not disappoint. If you feel frustrated by the state of our country and have a deep desire to live your life to the glory of God then read this. I would be interested in talking about it with you. If I'm not careful, politics make me despair. This book was one of many reminders this year that my hope lies in Jesus Christ alone. Favorite, favorite book of the year. Chad and I will be giving this as a wedding gift (along with our traditional wok, of course) for years to come. If you know me, you will know that I am a huge Russell Moore fan. He's one of the prophets we need in our current generation. In this book he writes with personal stories, expertise, and Scripture to show us how our lives are to be shaped by the cross of Jesus. I believe this book is a guide book for our lives in singleness, marriage, parenting, aging, and everything in between. I've already given two copies away. Maybe you'll receive the next. I could go on and on about the books I read this year. I only hated one book and couldn't finish it. I'm not skeptical when I read, but I'm also not naive taking in every thought thrown my way. Being a weak-willed woman in my reading isn't an option, so I work to measure it against Scripture and through community. The combination of Scripture and reading other books increased my gratitude this year. I'm not exactly sure how or why, but I trust God works in us through various means to make us more like him. My reading list for 2019 isn't quite curated, but I'm hopeful to continue to be challenged, to change wrong thinking, to strengthen right thinking, and to keep growing. God forbid I stay the same. Books help me change. To help you in your process, I'm going to give away three books from this list in a little giveaway: The Storm-tossed Family, Liturgy of the Ordinary, and The Imperfect Disciple. (If you win and already have one of these books, we will negotiate a trade.) All you have to do is comment on this post or on the Facebook post advertising this giveaway. Share what book you would like to read from my list and/or a book you really loved this year. I'll draw a name in about a week. Feel free to share this post to spread the word. Happy 2019 to each of you! Be disciplined this year and watch God change and grow you in unsearchable ways. What are you reading? What are you looking forward to reading? 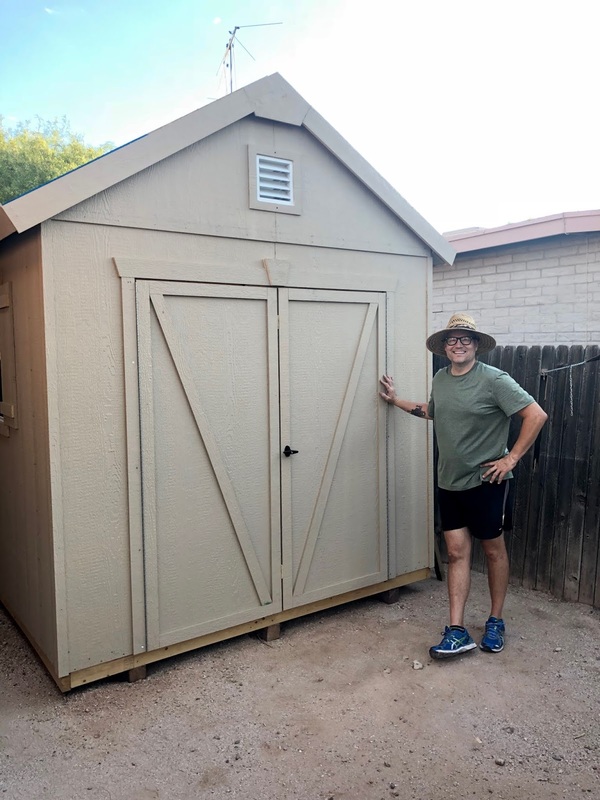 What is a different project you finished this year? 19 important comments so far. What are your thoughts? Wow, so glad to see your post! I opened my feed reader and yours was at the top this morning. I love the start of a new year, and posts that look back and look forward. As I read through your post I saved The Trellis and the Vine, Letters to the Church, and Faith Among the Faithless to my reading list. I am part of a team at my church working to develop leadership within the church that partners with our community. It is hard work learning our congregation's personality, strengths, potential, and culture and then determining how to parlay that into outward momentum. I'm hoping those three books will give me some new ideas ;) Thanks! Your amount of reading is inspiring. I would love to read The Storm-Tossed Family! Liturgy of the Ordinary is definitely of interest to me! I read the Chronicles of Narnia series this year--they were "easy" reads, but such a joy, and God came to life in ways he hadn't before. OMGosh. Storm Tossed Family is the one I NEEED! The Storm-Tossed Family and The Liturgy of the Ordinary sound fabulous. And I'm currently enjoying The Road Back to You, on your recommendation. I don't know that I can pick just one I would like to read! But using the filter of my 3 Littles, I'm most likely to read Liturgy of the Ordinary or The Imperfect Disciple. I've been working on In His Image by Jen Wilkin for what feels like forever but the chapters on Holiness and love helped me overcome some unrealistic expectations of others. 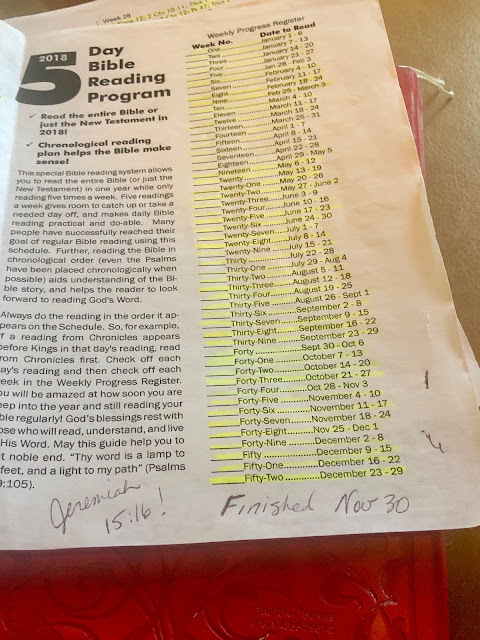 It took me 3 hours to actually get all of this read and I'm so glad I finally made it to the end (not because of the writing but because of my children)! I am always so inspired to read, but find myself falling short in the task these days. I really hope to change that this year and set some good goals. I would love to read the Storm-Tossed Family. I’m not a good finisher when it comes to books, and other things- I’m a much better starter. 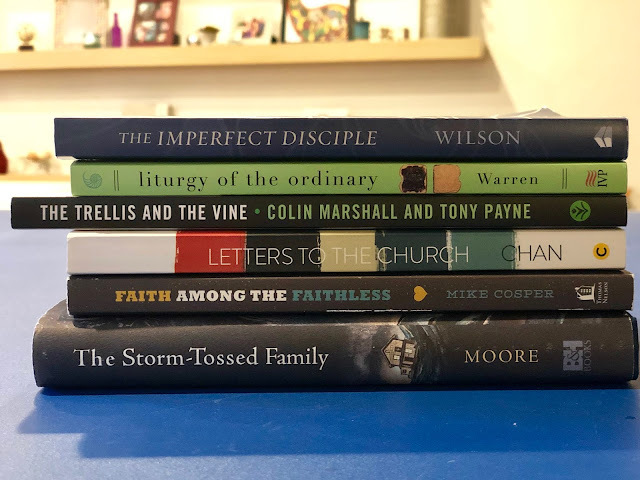 One way or another, I’m going to read at least two of the following in 2019.. Storm Tossed Family, A Peculiar Glory, and Letters to the Church. Thank you for sharing practical and desperately needed disciplines! I also read more books last year than in recent years, but less than I would like to (and many of those were fiction, which is much easier for me to get through)! Faith Among the Faithless sounds like it will need to be added to my list soon. My favorite book I read last year was probably Jen Wilkin's None Like Him, followed closely by The Gift of Failure by Jessica Lahey. Letters to the Church, The Storm-Tossed Family and The Liturgy of the Ordinary sound super interesting. If I was honest, the past year took it out of me. Grad school, coupled with studying for boards, plus work plus raising a small human...finding time to read and absorb and process was challenging. Just recently I picked up a fiction book and have slowly made some progress. The reality is that reading is a healthy and necessary discipline in my life. I need to read to know God's word better but also give myself time to hear my own heart. My hope and prayer is that this year is one of intentional rest and discipline, and that through this season of rest and reading that God would prepare my exhausted heart to keep running and finding Him. I really enjoyed reading this. I am inspired by your dedication to finishing all of these books. I have always been an avid reader and love it but have found it more difficult this past year to commit to it on a regular basis. All of these books sound amazing, especially the Storm Tossed Family.